Submitted by keenan on Tue, 2008-07-08 09:53. 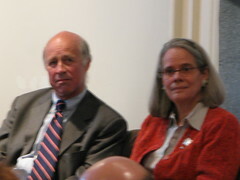 The first monthly meeting was held yesterday afternoon at the governor's Manhattan office. Mr. Bloomberg, who spoke to reporters after the sit-down, said it went well and credited the governor for making sure there is a good line of communication between the city and Albany. 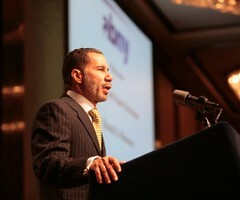 "We worked well with the Pataki administration and with the Spitzer administration, but David Paterson seems particularly open to it," he said, according to a transcript of comments he made after the meeting, which was provided by an aide to the mayor. Mr. Bloomberg did not hold regular, monthly meetings with governors Spitzer or Pataki. He said he has a formal meeting with the City Council speaker, Christine Quinn, once a week. The meetings with the governor may be part of an effort to promote a unified relationship. Last month, the two leaders sought to distance themselves from a report that said the governor, in a private conversation, called Mr. Bloomberg an untrustworthy, angry man who is out of touch with regular New Yorkers. Adding further pressure to the relationship are polls showing that the mayor would be a popular gubernatorial candidate, even though he has said he will not run for the office. Submitted by keenan on Mon, 2008-06-16 17:58. Last Thursday, Mayor Bloomberg testified before the Senate Banking Committee about the state of the nation’s infrastructure. “We are facing an infrastructure crisis in this country that threatens our status as an economic superpower - and threatens the health and safety of the people we serve,” he said. Bloomberg testified in favor of the creation of a National Infrastructure Bank that would issue up to $60 billion in tax credit bonds for infrastructure projects throughout the country. Earlier this year Bloomberg founded the Building America’s Future coalition with Governor Schwarzenegger of California and Governor Rendell of Pennsylvania. Last week’s passage of the Amtrak reauthorization bill holds some promise for more federal funding for Moynihan Station, but the fact remains that state and local governments are responsible for three out of every four dollars spent on public infrastructure. New York City alone “needs $29.5 billion just in the next five years to continue to bring our mass transit system up to a state of good repair and to expand capacity to meet expected demand,” according to Bloomberg. To remain the world's economic superpower, we must build the infrastructure to support strong and sustained growth. And that means, very simply, things have got to start changing in Washington. First, we need to set clear goals - both for the short-term and long-term - and clear metrics for measuring success. Right now, we have no coherent national transportation policy. It's just a grab bag of programs with no goals that correspond to national priorities, such as reducing our dependence on oil and cutting our greenhouse gas emissions. We also lack performance standards to ensure we can meet our goals, which is just basic accountability. And we lack incentives that encourage cities and states to be more efficient, which is a basic idea of market economics. These practices are straight from Management 101, and we need to put them to work when it comes to transportation. Second, we need to dramatically increase funding to help achieve our goals. Infrastructure costs money. But polls show that people are willing to pay for it - if they know they will benefit from it. Voters are smarter than politicians give them credit for being. They know there's no free lunch. But if they're paying for sirloin, they don't want to get served a bunch of baloney. To create the new funding we need, all options should be on the table, including general revenue, user fees, gas taxes, and public-private partnerships. Third, we need to fund projects based on merit, not politics. One of the most promising concepts is the one introduced by Senators Dodd and Hagel: a national infrastructure bank. The bank would create an independent and nonpartisan entity that would fund the most vital needs - not the most parochial pork-barrel projects. The bank's nonpartisan structure would also help us achieve the first principle I mentioned: instilling clear performance standards and accountability measures into projects. These three principles are not Democratic or Republican. They are simply basic ideas that anyone serious about addressing our national infrastructure crisis should be able to support. Submitted by keenan on Thu, 2008-06-12 17:11. Today at a Crain’s breakfast, Deputy Mayor Robert Lieber expressed interest in the Port Authority taking over Moynihan – “they have money,” he said. This comes one month after Mayor Bloomberg deemed it a “horrible idea.” Crain’s has a recap and video. Money for Moynihan in Amtrak Bill? Submitted by keenan on Wed, 2008-06-11 17:45. Yesterday, we posted on the passage of the Amtrak reauthorization bill, which includes a plan to solicit private proposals for a high speed train between DC and NY. Today, Eliot Brown of the New York Observer cites a source in Representative Jerry Nadler’s office and reports that part of the $2.5 billion grant program could provide a boost to Moynihan Station. Submitted by keenan on Tue, 2008-06-10 18:31. The Amtrak bill that would solicit private sector proposals to build a high speed rail link between DC and NY passed the House on Tuesday. Gannett News reports that the 227-187 margin fell short of the majority required to override a Bush veto. In addition to providing Amtrak operating subsidies over five years, the measure seeks to boost investment in high-speed rail. It also calls for opening up the Washington-to-Boston route and 10 others across the country to private competitors — something Democrats such as Sen. Frank Lautenberg of New Jersey strongly oppose. Though President Bush likes the bill’s privatization proposal, he rejects boosting funding for passenger rail if Amtrak isn’t held more accountable and doesn’t change the way it does business, the White House said in a statement explaining the veto threat. Lautenberg, meanwhile, co-wrote an $11.4 billion Amtrak bill that passed the Senate 70-22 in October. House and Senate negotiators have to come up with a compromise bill, which would then have to pass Congress and win Bush's signature to become law. Governor David A. Paterson today appointed 12 members to the Commission on Metropolitan Transportation Authority (MTA) Financing, to be chaired by former MTA Chairman Richard Ravitch. The Commission is charged with recommending strategies to fund MTA capital projects and operating needs over the next ten years, a period when the Authority will be under unprecedented financial pressure as it expands its system and rebuilds its core infrastructure to provide the additional capacity needed to allow the region to grow. Governor Paterson announced in April that Richard Ravitch would head the Commission in wake of the failure of the congestion pricing proposal, which would have provided an additional revenue stream to the MTA….More here. Submitted by keenan on Mon, 2008-06-02 18:26. "I met today with Congressman John Mica of Florida, the Ranking Republican on the House Committee on Transportation and Infrastructure, who briefed me on his plan to encourage proposals to bring high-speed rail service to New York. Congressman Mica's plan makes a great deal of sense and I strongly support it. High speed rail service could cut the travel time between New York and Washington to only two hours. This would encourage more people to take the train, which simultaneously would relieve congestion at New York City airports and reduce our greenhouse gas emissions. "Congressman Mica's plan, which is included in the House Amtrak reauthorization bill, would solicit proposals - including proposals from the private sector - to build the high speed rail service. Those proposals would be evaluated and presented to Congress for further action. Soliciting and considering proposals is an important and necessary first step toward determining the feasibility of this initiative. "Congressman Mica's plan demonstrates the kind of ambitious, pragmatic thinking about our future that guided PlaNYC and that Building America's Future - my coalition with Governors Rendell and Schwarzenegger - is asking Congress to provide. Investing in modern mass transportation is critical to New York's future, and all options should be on the table. No idea should be ignored or dismissed simply because it is ambitious. That is not how America's greatest infrastructure marvels - from the Brooklyn Bridge to the Grand Coulee Dam - got built." Submitted by keenan on Thu, 2008-05-29 10:04. 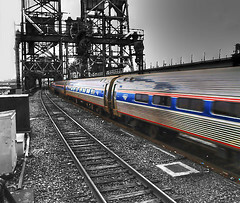 Yesterday, the New York Sun reported that Mayor Bloomberg will be meeting with Rep. John Mica on Friday to discuss his proposal for a high speed rail link – or “rocket train” – between DC and NY, a bill we detailed last week (see ”New DC/NY High Speed Rail Link?” and “DC/NY High Speed Rail Legislation Advances in House.”) It's no surprise that Senator Moynihan was an early proponent of the idea. "It's a little late in the game, but we need it," the chairman of the political science department at Touro College, David Luchins, a longtime adviser to Senator Moynihan, said yesterday in an interview. "It's important because of the cost of oil, its important because of the environment, and it would be great for the economy — I see no downside. It is the most economically sound way to move people from New York to Washington." Mr. Luchins also said that the job of generating political support could be eased by the disgruntlement of lawmakers who must deal with the rigors of shuttling between New York and Washington. "The senator used to say you get one less day in purgatory for every day you have to spend on the shuttle," Mr. Luchins said. A spokesman for Mr. Mica, Justin Harclerode, said Amtrak could participate but that the congressman envisions creating high-speed service that would be independent of existing commuter and freight lines, which would likely require new tunnels and ridding existing tracks of curves to facilitate speed. On Tuesday, Bruce Reed, the president of the Democratic Leadership Council, and Paul Weinstein, chief operating officer of the Progressive Policy Institute, presented high-speed rail as the solution for air congestion in an editorial for Newsday. That's why the next president and the new Congress should commit to building five new high-speed rail corridors in the next 10 years. The corridors would be selected based on three key criteria: geography (the flatter the terrain, the faster the train); a high probability of use (densely populated corridors with significant levels of highway and airborne traffic); and a commitment by the private sector, states and localities to share in the cost of construction. Wherever possible, the high-speed rail corridors should connect to major air hubs. Roads and airports have direct sources of financing - namely, taxes on gasoline and ticket purchases. If high-speed rail is going to become a reality, it will need a similarly robust stream of income. That's why policymakers should establish a trust fund that would finance construction and maintenance. We could pay for this investment in a number of ways: carbon-offset purchases; a 4.3-cent diesel gas tax on the railroad industry that would raise about $200 million a year; ticket surcharges; and/or matching contributions from states served by the new rail lines. How this would impact Moynihan Station remains unclear. Submitted by keenan on Fri, 2008-05-16 09:51. What's more important right now is that Paterson is trying to revive a development that would be a major boon to New York - provided the project is designed so as to maximize public benefits and minimize public costs. Thanks to a rezoning that permitted construction of 5.5 million square feet of office space, the developers and Cablevision stood to reap handsome rewards as long as they invested in a new train station. But no one ever settled how much the builders would pay, how much the public would kick in or even what kind of station they planned to offer. Still, it was clear that their most magnificent design was - and is - unaffordable at almost $3 billion. So, first things first for Paterson, Bloomberg and all involved. As they seek to entice Cablevision back to the table, they must determine whether it is possible to design a station that provides major transportation improvements at minor public expense. Aides say that's Paterson's goal. Excellent. Holding to it will mean refusing to simply tap into $2 billion that the Port Authority has set aside for transportation projects in New York. The public needs the biggest bang for the buck. Let's see what it is. Paterson agreed with the rationale behind Port Authority control of the halted project - a position Mayor Michael Bloomberg bitterly opposes. But, he said, he hasn't decided if that agency is the best choice to lead the Penn Station redevelopment project. The Empire State Development Corp. is currently the overseer. Paterson said he is open to a funding solution that would lead to actually moving dirt at Moynihan as well as at other financially troubled developments, including the Hudson Yard site. "We've gotta take all those projects, bring the stake holders in, have a conversation about what is working and what isn't working and show leadership," Paterson said after a news conference at his executive chambers in Manhattan. Submitted by keenan on Thu, 2008-05-15 12:25. This, of course, pits Paterson against Mayor Bloomberg, who was less than thrilled with Schumer's rejection of a key part of the mayor's plan as "the goofiest thing" he had ever seen. Bloomberg retorted that perhaps Schumer should mind his own business. The governor insisted the disagreement over Moynihan Station "isn't a personal feud," and praised Bloomberg for voicing concerns now rather than at some point down the road, adding: "He did what public servants should do." Paterson said he will "weigh" Bloomberg's concerns as he works to reach a final decision on Moynihan, but he also called Schumer's proposal "a good idea." Paterson also again defended his decision to do away with the two-chair structure Eliot Spitzer created at ESDC - a move that has brought him considerable grief from upstate business leaders and editorial boards. The governor said he doesn't have anyone "teed up" to run the development corporation; he has appointed a commission to help him find someone. Submitted by keenan on Wed, 2008-05-14 18:32. 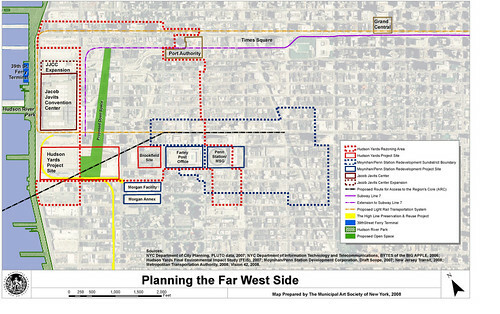 Last night, the Municipal Art Society convened a panel to discuss next steps for Moynihan Station and the priorities for the Far West Side. 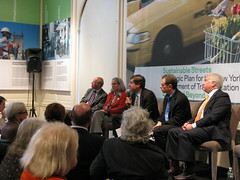 Panelists included: Kent Barwick, president, Municipal Art Society; Richard L. Brodsky, assemblyman, New York State Assembly; Anna Hayes Levin, chair, Community Board 4; and Daniel A. Biederman, president, 34th Street Partnership; and Kathryn S. Wilde, president and CEO, Partnership for New York City. 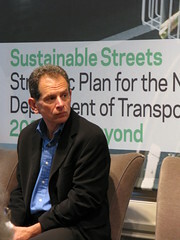 The moderator was Charles Bagli, reporter, The New York Times. “I still think moving MSG makes sense,” said Anna Hayes-Levin. She admitted that the Garden is currently out of the picture, but she said establishing some real leadership at the state level could bring the Dolans back to the table. “That’s what was missing before,” she quipped. Meanwhile, up in Albany, Governor Patterson signaled that he is taking important steps to establish a strong role in Moynihan and other key projects. According to the Daily News, Paterson said that he wants to convene a summit involving the key parties of the projects in need of “real serious conversation” – Moynihan Station, Ground Zero, Hudson Yards, and Javits Center – an idea proposed by the New York Times in March. "I think they can be resurrected," he said. "That's why I would like to bring all those parties together to perhaps decide where are the priorities, No. 1, and secondly, what is achievable, and thirdly, what is not achievable." There are many compelling reasons for giving this job to the Port Authority. It appears to have $2 billion to contribute, a very healthy start. Also, the Port Authority, which builds and maintains major public facilities, has hundreds of engineers, planners and experts. Transportation is their thing — bridges, ports, airports and, yes, train stations. Today’s Port Authority also has the political leadership — and the transparency — needed to move forward successfully on this complicated project. Both Moynihan Station and Hudson Yards would bring sizable, long-term benefits to the city’s economy. The main thing is to get them both fully on track now, while Mr. Bloomberg is still mayor. There is no guarantee his successor will share his vision and commitment to the large-scale, transformative, private-public projects that bring out the best of New York. We will have plenty more from last night’s event in the next few days.